Now Available in Over 100 Countries! The human adult stem cell conditioned media in LUMINESCE™ cellular rejuvenation serum contains cytokines, which have the same attributes as the cytokines in the human body. This allows for a perfect interaction between our product and natural skin cell processes. The growth factors and cytokines provided by the stem cell technology work with the natural processes of the skin to support rejuvenation and decrease the appearance of fine lines and wrinkles. The patent-pending technology of LUMINESCE cellular rejuvenation serum provides for the delivery of key growth factors found naturally in your skin. As we age, these growth factors are reduced, and this is one of the underlying reasons skin has an aged appearance. This commonly shows up as the appearance of fine lines and wrinkles. As the effects of LUMINESCE™ cellular rejuvenation serum work in tandem with natural processes of skin renewal, visible results will vary from person to person due to varying skin types. Moderate skin renewal may occur within four weeks, but optimal improvement to the skin is generally not reached until after three months of daily use. There will be no negative effects, but the benefits of using the serum will not continue if it is no longer used. The visible signs of ageing will eventually return. 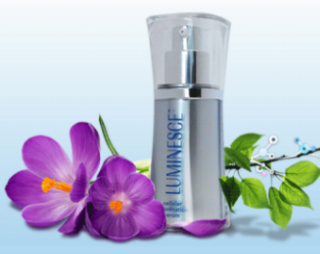 LUMINESCE™ cellular rejuvenation serum comes in a pre-measured pump. One to two pumps of the serum applied to the face and neck morning and evening after skin cleansing, is the recommended usage. After washing your face, you may choose to apply a toner first. However, no other creams or serums should be applied before LUMINESCE™ cellular rejuvenation serum as this could block the product from being properly absorbed into the skin. There are no stem cells are in the serum. A natural liquid media is conditioned by the human adult stem cells. This conditioned media now full of over 200 growth factors is completely separated and this is what is used in LUMINESCE Cellular rejuvenation serum. LUMINESCE™ cellular rejuvenation serum contains more than 200 growth factors. How many growth factors are normally in such a prestigious product? There is no product currently on the market that rivals LUMINESCE™ cellular rejuvenation serum. Although a few products claim to use stem cell’s, they are generally derived from plants and fruits such as apples. Since we are humans and not plants these plant stem cells cannot communicate with our cells like human-derived growth factors do. The growth factors in LUMINESCE™ cellular rejuvenation serum are the language of the cells and are used for cellular communication. Ongoing research continues to teach us more and more about this important cellular communication process. There is nothing in the serum that is known to have a negative effect during pregnancy. It is always advisable to consult with your physician. Can LUMINESCE cellular rejuvenation serum be used after facials, chemical peels, dermal abrasions and waxing? LUMINESCE™ cellular rejuvenation serum can be applied following facials, chemical peels, dermal abrasions and waxing, unless otherwise instructed by your treating health care practitioner or esthetician. After applying LUMINESCE cellular rejuvenation serum, is it absorbed into the skin? Yes. LUMINESCE™ cellular rejuvenation serum simply supports the body’s natural ability of the cells to renew and rejuvenate.